stories like cigarette ash on his cuffs. clanged in his dreams like the guns at Kiev. half blind by the end of it, still seeing too much. Sonya Taaffe's short stories and poems have appeared in such venues as Beyond Binary: Genderqueer and Sexually Fluid Speculative Fiction, The Moment of Change: An Anthology of Feminist Speculative Poetry, Here, We Cross: A Collection of Queer and Genderfluid Poetry from Stone Telling, People of the Book: A Decade of Jewish Science Fiction & Fantasy, The Year's Best Fantasy and Horror, The Alchemy of Stars: Rhysling Award Winners Showcase, and The Best of Not One of Us. Collected work can be found in Postcards from the Province of Hyphens and Singing Innocence and Experience (Prime Books) and A Mayse-Bikhl (Papaveria Press). She is currently senior poetry editor at Strange Horizons; she holds master's degrees in Classics from Brandeis and Yale and once named a Kuiper belt object. 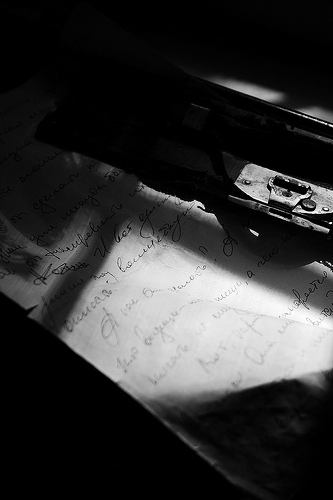 Photography: adapted from handwritten letter from Bulgakov on a bureau, by Jay Springett.